Three approaches exist to calculate the present or future value of an annuity amount, known as a time-value-of-money calculation. You can use a formula and either a regular or financial calculator to figure out the present value of an ordinary annuity. Additionally, you can use a spreadsheet application such as Excel and its built-in financial formulas. When people discuss annuities, they're often referring to an investment product offered by insurance companies. These investment instruments involve fixed payments made into the annuity for a certain number of years, capital appreciation at a predefined interest rate, and then, upon retirement, fixed payouts as an income replacement. Paying fixed rent each month represents another example of an annuity since it's a regular series of payments to your landlord. When you calculate the present value (PV) of an annuity, you'll be able to find out the value of all the income the annuity's expected to generate in the future. The calculation factors in the amount of interest the annuity pays, the amount of your monthly payment, and the number of periods, usually months, that you expect to pay into the annuity. The PV calculation represents the time-value-of-money concept, which says that a dollar now has more value than a dollar earned in the future, because of the interest you could have earned by investing those future dollars today. Note that this equation assumes that the payment and interest rate do not change for the duration of the annuity payments. Say you want to calculate the PV of an ordinary annuity with an annual payment of $100, an interest rate of five percent, and you are promised the money at the end of three years. When calculating the PV of an annuity, keep in mind that you are discounting the annuity's value. Discounting cash flows, such as the $100-per-year annuity, factors in risk over time, inflation, and the inability to earn interest on money that you don't yet have. Simply put, since you do not have the yearly $100 annuity, or $300 in your hand today, you can't earn interest on it, giving it a discounted value today of $272.32. Using the above formula to work PV problems takes a little time. You can use a financial calculator or a spreadsheet application to more efficiently calculate present values. You can find the PV of an ordinary annuity with any calculator that has an exponential function, even regular (non-financial) calculators. Press N and 3 (for 3 years). Press i or I/YR and 5 (for the interest rate of 5 percent). Press PMT and -100 (be sure and make it a minus 100). Press PV and you will arrive at your answer of $272.32. Spreadsheets such as Microsoft Excel work well for calculating time-value-of-money problems and other mathematical equations. You can type the equation yourself or use a built-in financial function that walks you through the formula inputs. To locate the formula instead of typing it in, go to an Excel worksheet and click on Financial function in the Formulas menu. View the drop-down menu and click on PV. You'll see a dialogue box open with spaces for you to fill in the information for your PV calculation. Using the previous inputs, fill in the interest rate of 0.05, the time period of 3 (years), and payments of -100. You'll end up with the function above. If the formula doesn't automatically calculate, go to the right-hand side of the worksheet at the top and click on Calculate to get the answer of $272.32. You can also use this ​online calculator ​to double-check your calculations for the PV of an ordinary annuity. You may be considering purchasing an annuity product and want to know how much your annuity would be worth at some point in the future based on what you can afford to pay into it each month. If you know how much you'll pay each month, the interest rate you'll receive, and the number of months or years you intend to pay into the annuity, you can use a formula very similar to PV to calculate the annuity's future value (FV). As in the PV equation, note that this FV equation assumes that the payment and interest rate do not change for the duration of the annuity payments. You can also use the FV formula to calculate other annuities, such as a loan, where you know your fixed payments, the interest rate charged, and the number of payments. 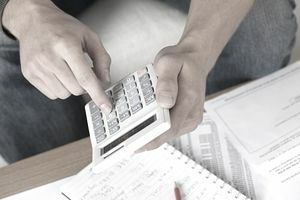 Calculating the FV would reveal your total cost for the loan. The process to calculate FV using a calculator or spreadsheet works in exactly the same manner as the PV calculations, except you would use the FV formula and appropriate inputs to find your result.